It's really good fun to occasionally make something completely different to our usual subjects and style of work, and this little project is simple, quick and very adaptable to your own innovations and ideas. I have made two different designs for you to follow so you can either make the earring design into a larger pendant, the pendant design into smaller earrings, or adapt the designs with your own ideas. The designs have a flavour of Art Deco and are elaborated by the contrasting colours of the wood species that I have chosen. Due to the scale of this project, much of the work has to be done 'handheld', so it is of the utmost importance to be sure that your tools are razor sharp, and that you always maintain focus and make sure that your fingers are either above or behind the direction of cut. Scan or photocopy the designs. Enlarge or reduce their size to your exact requirement and then print them onto card. Carefully cut them out and use them as templates to transfer the designs onto your wood, making sure that the grain of the wood is running vertically. 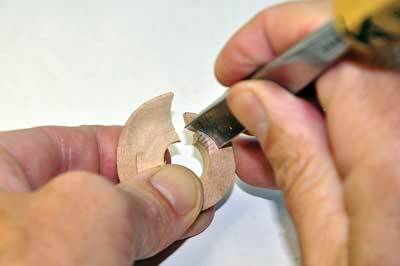 Also make sure that you reverse the circular earring template for the second earring. 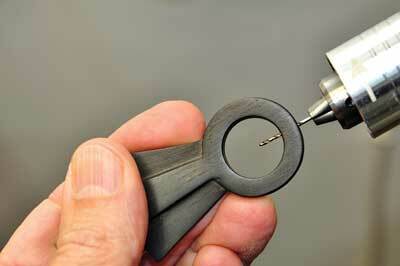 Measure the inner circle of the earring and make this hole using a drill bit of the exact same size - mine was 14mm. 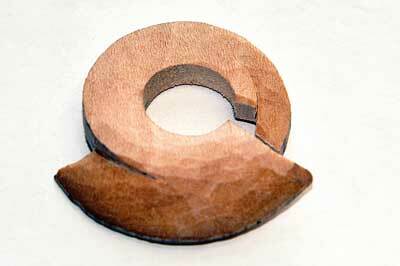 Using a bandsaw or fretsaw, cut accurately along the outside of the line. Draw a guide line along the edge of the earring that tapers around from approximately 3mm on the right side, to being flush with the surface on the left. 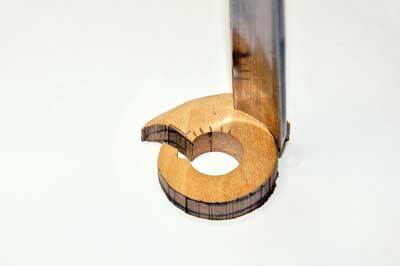 Use a 12mm No.2 to pare the wood back to this line. Use the 12mm No.2 upside down to gently curve the lower section from the centre down to and along the lower edge, and from the centre up into the drilled circle, but tapering the depth from approximately 3mm at the edge on the right, and rising flush onto the surface after 12mm to the left. 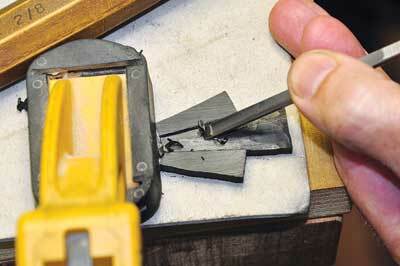 Using a 16mm No.7, gently make a cut along the lower line, carefully rocking the gouge from shoulder to shoulder. 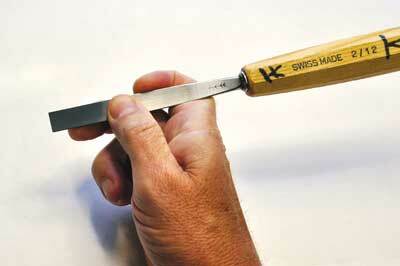 Use the 12mm No.2 to taper the depth from the level surface at the right, down to approximately 2-3mm on the left. Repeat these last two steps several times until the correct depth is reached. Now turn the earring upside down and repeat steps 7 and 8 on the opposite curved line. The section along the edge is carved approximately 1-2mm lower than its adjoining section above. The basic shape is now completed on this side but will be finely tuned with abrasive later. We now turn our attention to the opposite side, our aim being to follow the contours that we created on the first side, making a negative impression of them. 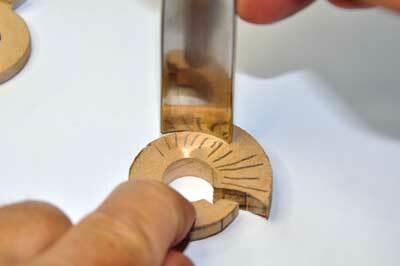 Use the 16mm No.7 as you did in step 7 to carefully cut along the line. 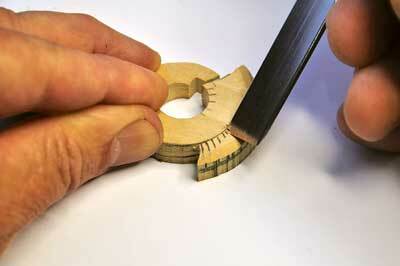 Use the 12mm No.2 to pare the wood away along this line. Continue around the band, following the contour of the opposite side, until it is approximately 4mm thick all the way around. 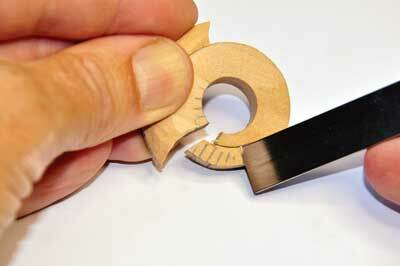 Use a 10mm No.5 to create the concave curve, carefully following the contour of the opposite side. 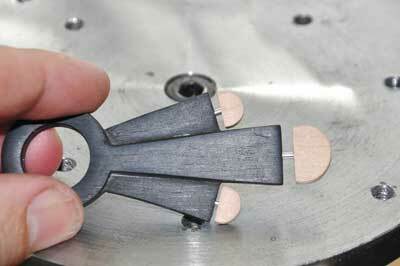 It should be about 3mm thick in the centre, tapering out to sharp points at both edges. 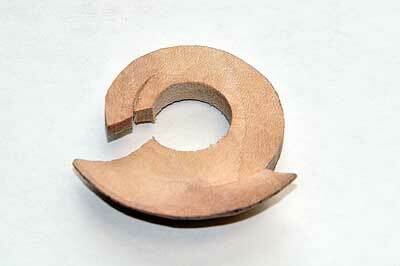 Turn the earring upside down to the opposite edge and use the 16mm No.7 to cut along this line. 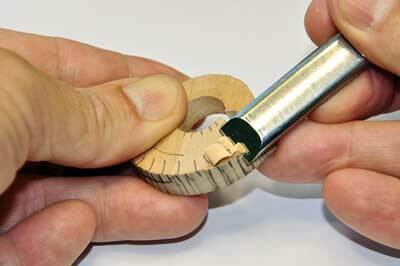 Use the 12mm No.2 to pare the wood from the lower edge next to the inner circle, until it is 1-2mm lower than the adjoining higher one. Your earring is ready to be sanded. Repeat the above steps on your second earring. Start with grit 100 and work over the complete surface of the earrings, removing tool marks and blending all the angles naturally into each other. Be careful not to sand off the delicate straight edges around the circle - use sandpaper glued onto a small flat stick to help prevent this. When done, work through grits 150, 240 and 400, removing all the scratches from the previous grit. Next, we need to make a small drill hole in the top of the circle. 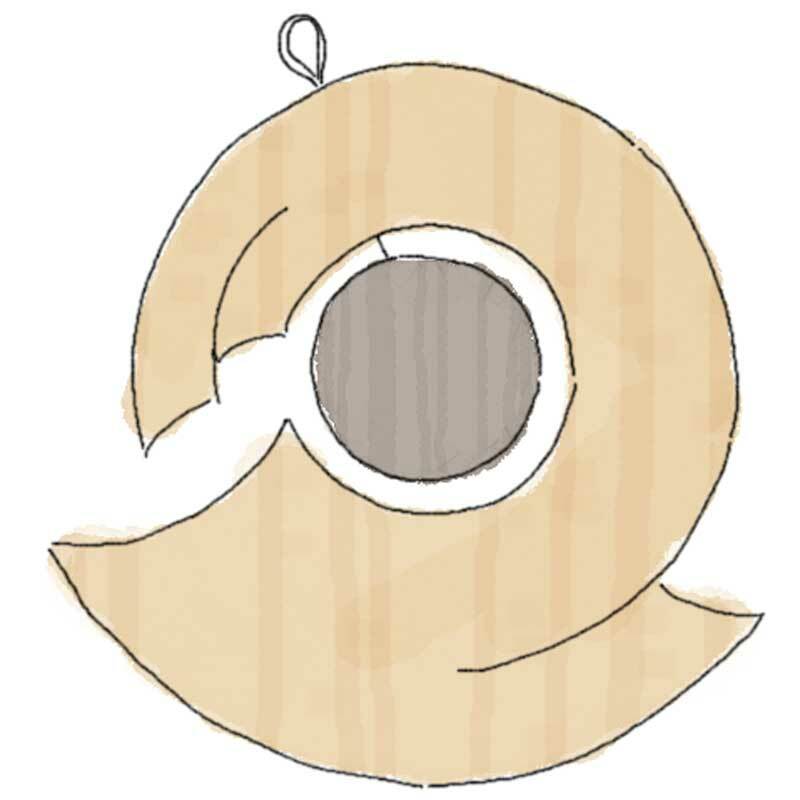 The best way to find the position for this is to put a small piece of dowel or a pencil into the centre hole and make a mark where the earring balances - this being the centre of its gravity and balance, and ultimately the best position for it to be suspended from the ear. 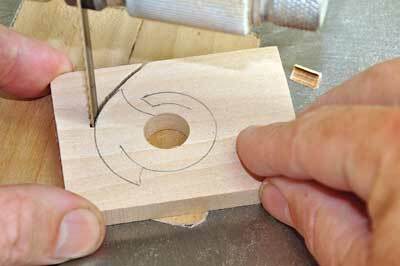 Do this and then using a 1mm drill bit, carefully make a hole centrally from the outer edge of the circle to the inner edge of the circle. 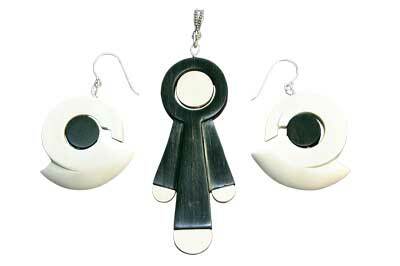 The little disk that sits in the centre of the earring is made from ebony and measures 12mm in diameter by 4mm thick. Draw the circle with a compass and cut it out as near to the line as possible. 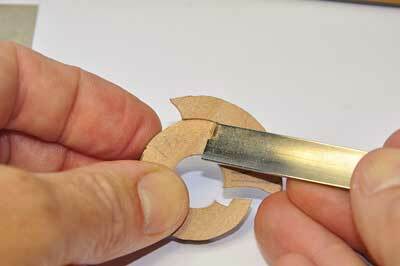 Use 100 grit sandpaper to round the edges accurately to the line, until you make a perfect disk. Sand through all grits. 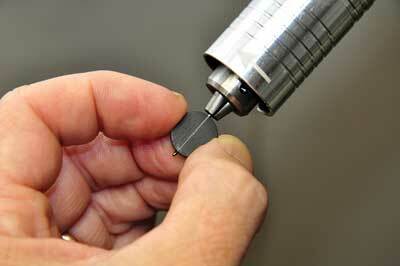 Now drill through its very centre with the 1mm drill bit. 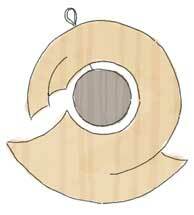 Transfer your pendant design to your wood with the grain running vertically. Drill and cut it out as with the earrings. 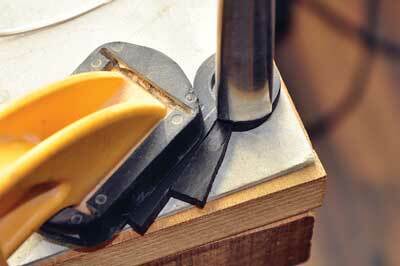 Clamp it to the side of your bench and use a No.1 chip carving knife to cut along the vertical line on the right-hand side. Using a 16mm No.7, gently press along the line of the circle. Pare the wood back between these two cuts with the 12mm No.2. 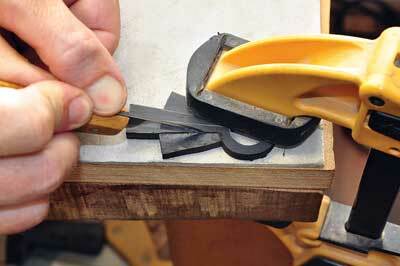 Repeat until you reach an even depth of 2mm, and repeat the whole process on the left-hand side. 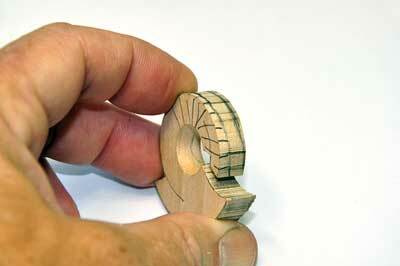 Turn the pendant over and use the same techniques as steps 18-19 to remove the middle section, using a 5mm No.5 to follow the line of the circle, and a 5mm No.2 to evenly pare away the wood. Sand through grits 100, 150, 240 and 400 using a sanding stick to keep your straight edges and get into the awkward corners. 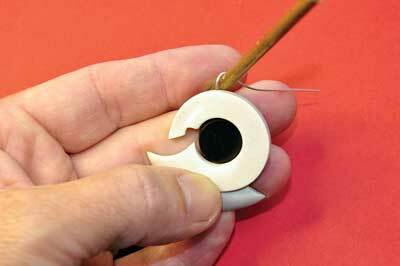 Drill a 1mm hole centrally through the top of the pendant. 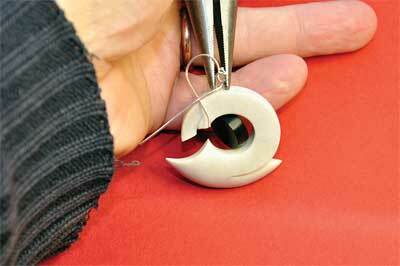 The little disk that sits in the top circle of the pendant is made from lime, applying the same techniques as the ebony one in the earring (see step 17). Mine is 14mm in diameter by 4mm thick. The lime end pieces of the pendant are made in the same way as above and then sanded down to their correct size. The centre one measures 14mm wide x 3mm thick. The two outer ones are 9 x 3mm. 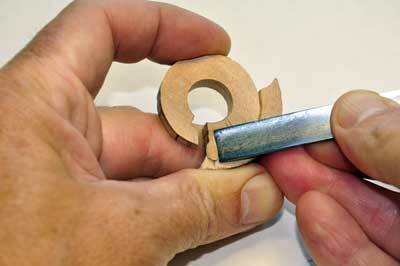 To fasten the lime end pieces to the pendant securely, pin them together as opposed to just gluing them. This is done by making accurate drill holes centrally in both the pendant and the end pieces, to a minimum depth of 3mm. 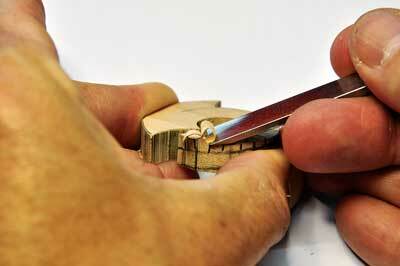 Then cut the pins to the correct size and glue them into both pieces with a spot of epoxy resin. I used 2mm pins. 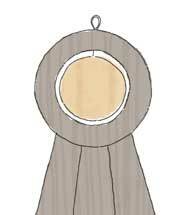 Findings are the term given to the metal parts that earrings and pendants etc are held together with and suspended on. 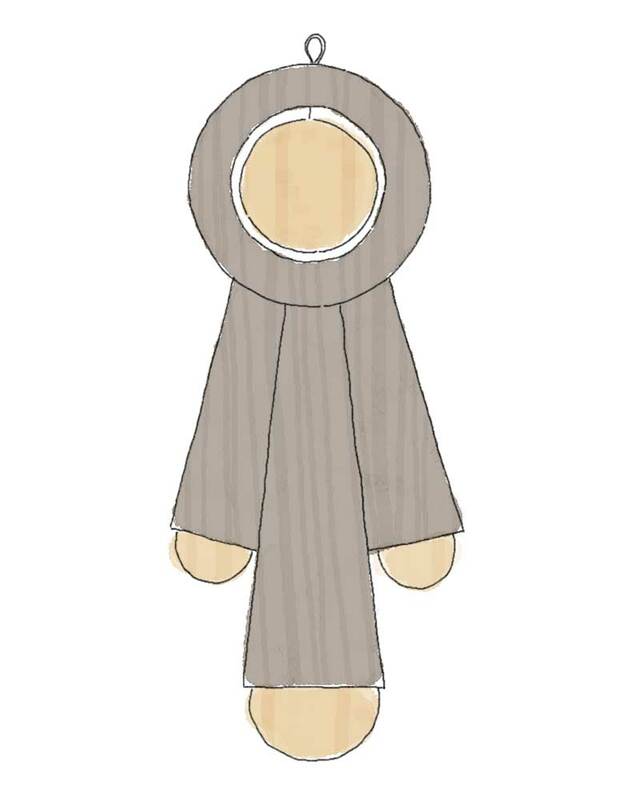 The parts we need for the earrings are a 'head pin' that goes through the ebony disk and earring; and the 'ear wire' that connects to the head pin and goes through the piercing in the ear. The pendant requires a head pin that goes through the lime disk and pendant, attaches to a 'jump ring', that in turn attaches to a 'bail' to secure the pendant to the necklace. 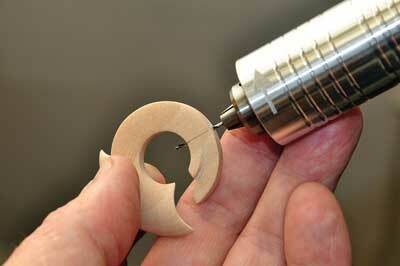 Thread the head pin through the 1mm hole in the lime/ebony disk and earring/pendant. 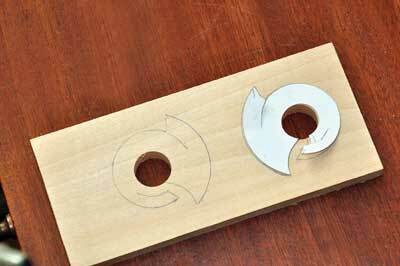 Bend it neatly around a small dowel. Thread the ear wire (earrings) or the jump ring (pendant) onto the head pin, and pinch together with a small pair of long nose pliers. 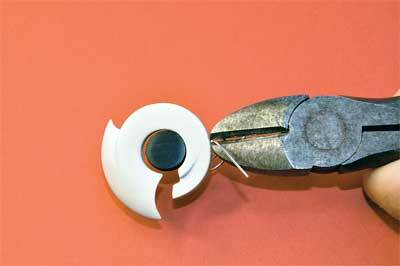 Trim off the excess with wire cutters. 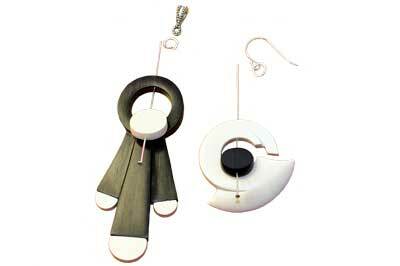 The pendant and earrings will make a beautiful gift for that special someone! I have quoted the sizes of tools used for my scale â€“ if yours is a different size, adjust accordingly. The Midlands Woodworking & Power Tool Show - Today!